This week I decided it was finally time to do something I have been putting off all summer; sort through my room back home. My family moved into our current home six years ago this month, meaning all of the bottles in this photo were bought within the two year period that I lived at home before going to college. When I first went through my stuff the amount of trash I had made me feel bad, like really bad. I couldn’t reconcile who I am now with who I was then. It’s not always easy getting rid of things you once thought were important, and sometimes it’s even harder to get rid of the trivial things you bought knowing they didn’t matter. It’s times like this when I remember why I wanted to get my story out in the first place. 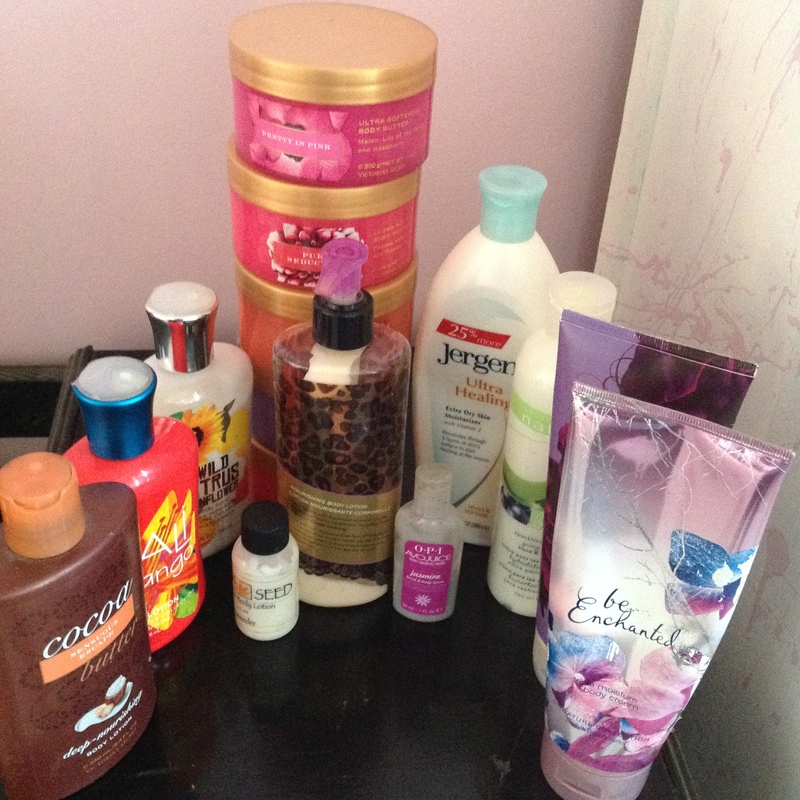 Today I posted a picture on Instagram of all the personal care items (shampoo, perfume, nail polish, etc.) that I previously had in my life. I got so many positive comments from people saying they had been through this. It was such a relief to hear people who now lead zero waste lives and influence so many others tell me that they too had been here before. They had unneeded stuff and excess waste at one point, too. This made me remember that my past choices are not my present failures. I can only live in the moment and work towards a more sustainable and environmentally friendly lifestyle. I feel it is important to point out that there is a definite color theme here of pinks, reds and purples, and that most of these items are marketed for women or girls. Things like the self-tanning lotion, the razor burn cream for your bikini line, and the nail polish are marketed almost exclusively towards women. Of course I had so much stuff that I never used, in a society that tells me it’s important to own nice smelling products no matter what they might contain. So what were all these items that I felt I so desperately needed four years ago while I was in high school? 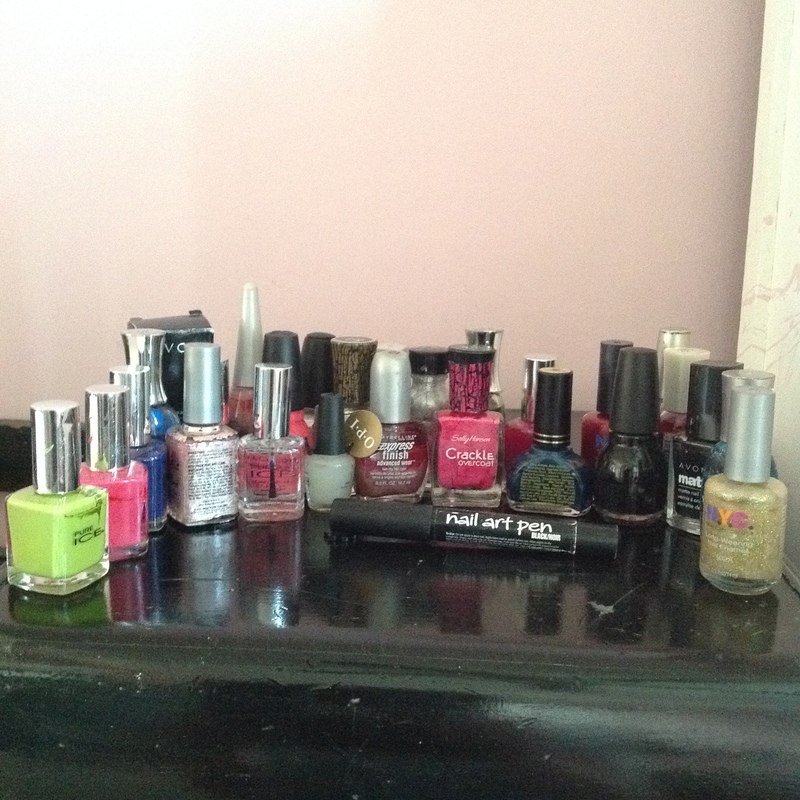 Most of them are items I have completely cut out of my life, like nail polish for example. 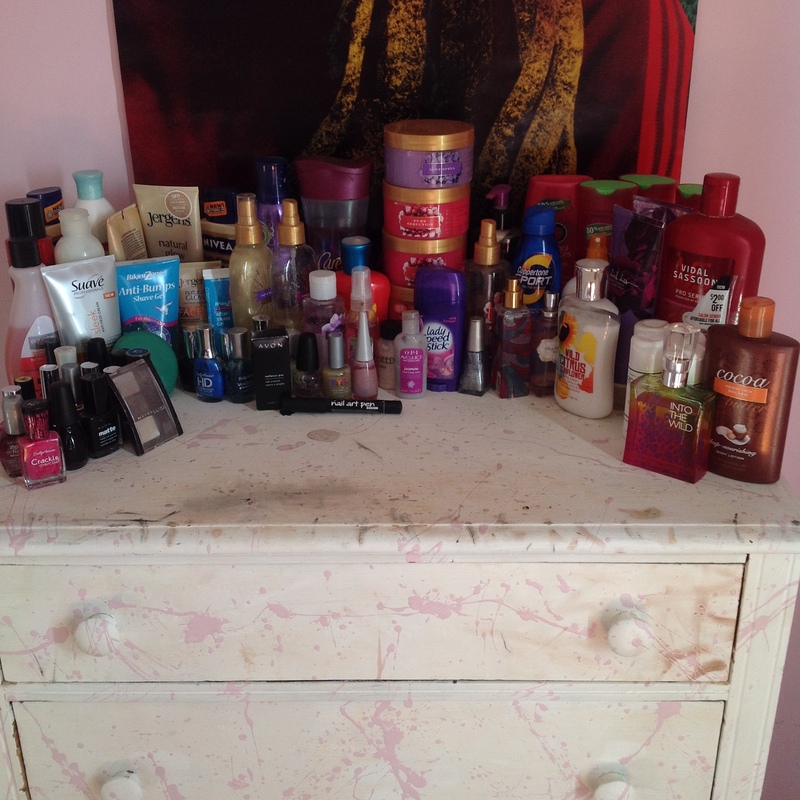 Here is a list of everything on that dresser and what I have subbed it out for currently. It’s longer than I expected, so please feel free to skip to the end. I promise the last paragraph is good! Sadly, my tiny nail polish bottles, that I cared for so much as to put little metal BBs in each one so that I could shake them and prevent drying out (a great tip by the way), are now in the trash. Most have not been used for years, and were almost empty. 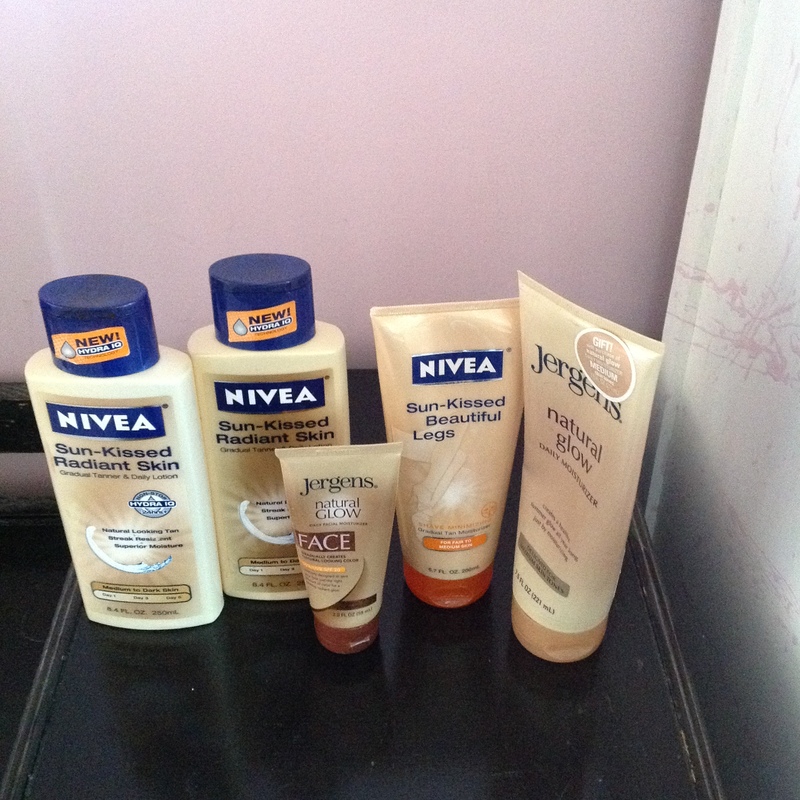 The ones that are newer and still usable I am in the process of giving away to friends. If by August I still have any, they will be trash. My bottles of self-tanner also found their way to the trash can. The bottles aren’t recyclable (at least not around here) and the contents contain chemicals that I can’t believe I once rubbed on my skin daily. I continued to use self-tanning lotions until I was a junior in college (that is over 5 years) when I realized that my pale skin is just as beautiful as anyone else’s skin tone. Throwing away those bottles was almost as liberating as realizing that I didn’t need them in the first place. 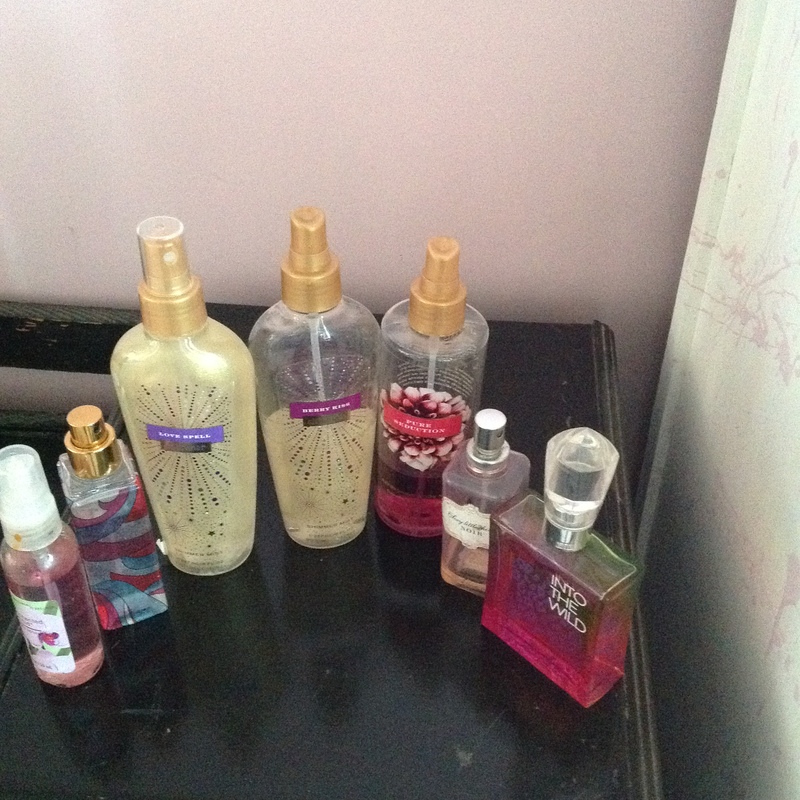 Much of my lotion is still full and unused. I am currently in the process of giving it away to friends who still use this store bought kind. What I can’t give away I am emptying into the trash and recycling the containers. I am currently playing around with making my own lotion, though I have found that plain coconut or almond oil work wonders. I still haven’t found a facial lotion that works for me without making my skin greasy. These little containers aren’t recyclable or reusable so I ended up throwing them away, contents and all. They contain plastic microbeads so I didn’t want to risk emptying them down the drain as microbeads pollute the world’s water supply! Alternative: I use coconut oil as a shaving cream/gel now. 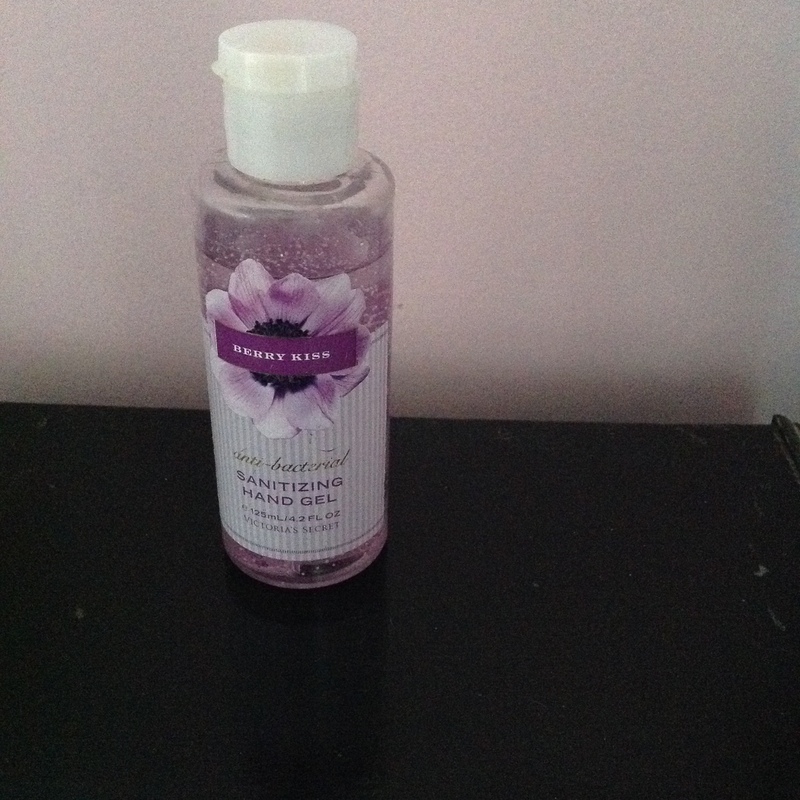 It leaves my skin feeling so much softer. 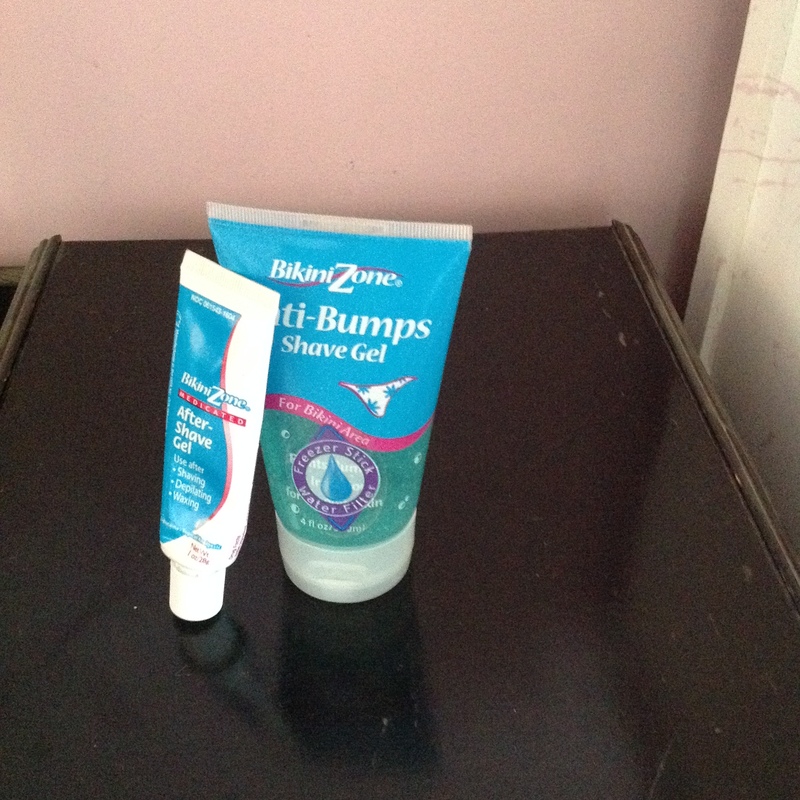 These gels were marketed specifically to women, with the basic message that when you shave sensitive skin you’re going to get razor burn, but these can help. They never did help me or my razor burn and I haven’t found an antidote for yet, though I have tried using black tea bags after I make a cup of tea. Just set it on a spot where you have bad razor burn and it seems to soothe it. The mousse got thrown away, but the hair spray got kept and I am using it until the last precious drop. 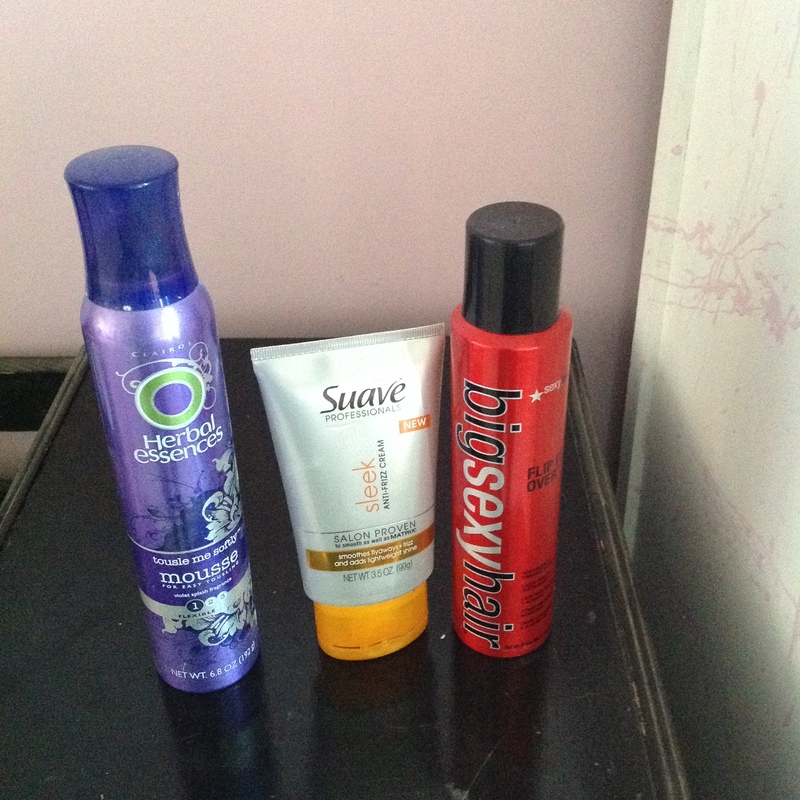 I never did like mousse in my hair, it just makes it oily because my hair is so fine. The hairspray on the other hand will be missed, and I don’t know of an alternative yet. I am using these up and then I plan to recycle the bottles. 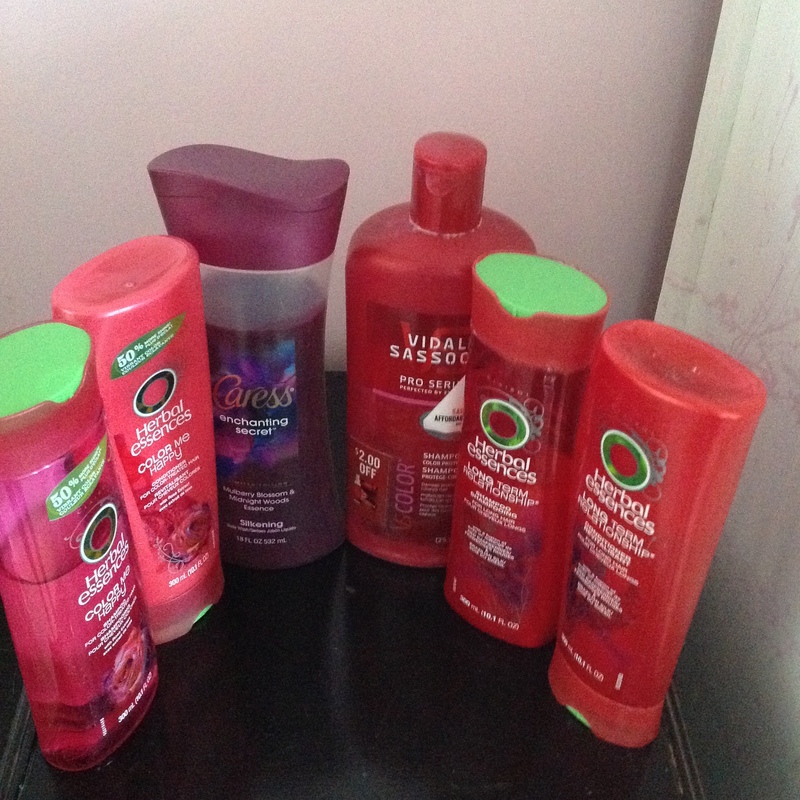 I use the shampoo both to wash my hair and to clean my bathroom. The conditioner is a great alternative to shaving cream, as well as helping you pull the tangles out of your hair. For a while my sophomore year of college I used a baking soda solution as shampoo and an apple cider vinegar solution as conditioner. It was working fine, once I got past the initial greasy hair stage, until I went in to get my hair dyed again and they used regular shampoo. It was too much work for me to redo months of training my hair to stop producing so much oil, so I just went back to regular store bought stuff. Once these bottles are empty, I plan to go back to my baking soda and apple cider vinegar. Most of these bottles are also still full. I plan on giving some to friends, and what’s left I am going to empty out and either recycle or reuse the containers. I think spray tops are too awesome to just be single use, and so handy!! Once I quit using it, I didn’t miss it. I’ve heard of people using water and essential oil, and if you save your bottles you can reuse them with your new homemade perfume. 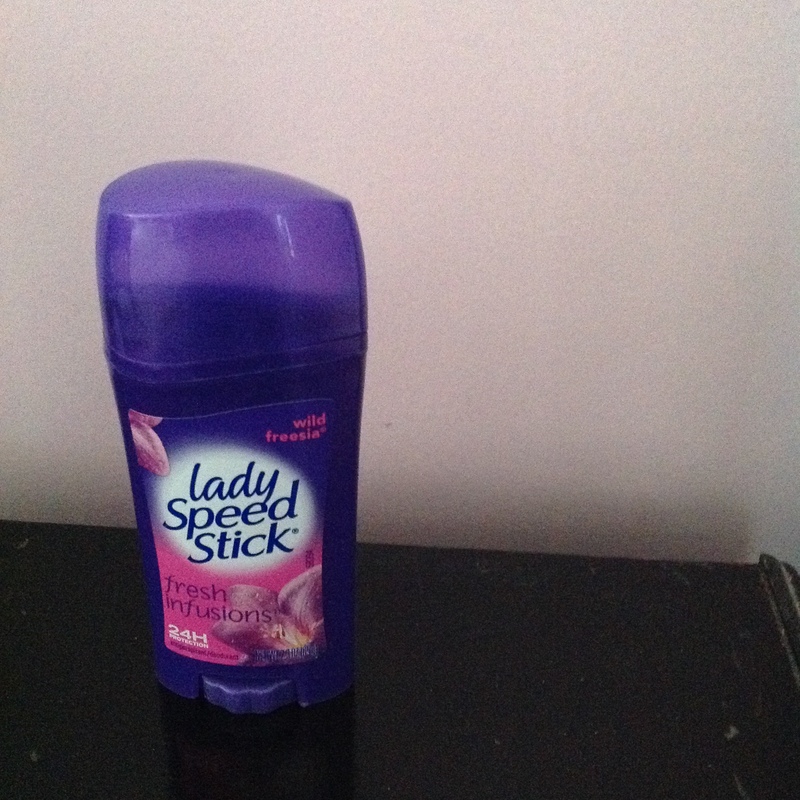 I am still using the remaining store bought deodorant I have (though it isn’t even this kind). Once I found something that worked for me, I stocked up. This deodorant is going to get cleaned out and the container is going to be saved so I can reuse it. Alternative: Make your own – But save your empties! I haven’t made deodorant yet, but it’s up next on the list! Once I am out of the store bought stuff I am going to try and concoct my own! I was never very good at putting on sunscreen, and really only use it if I am going to be outside all day long, say at the beach. This sunscreen is expired (by 4 years) and the bronzing spray was given to me by a stranger on the beach who couldn’t take it in their carryon bag. 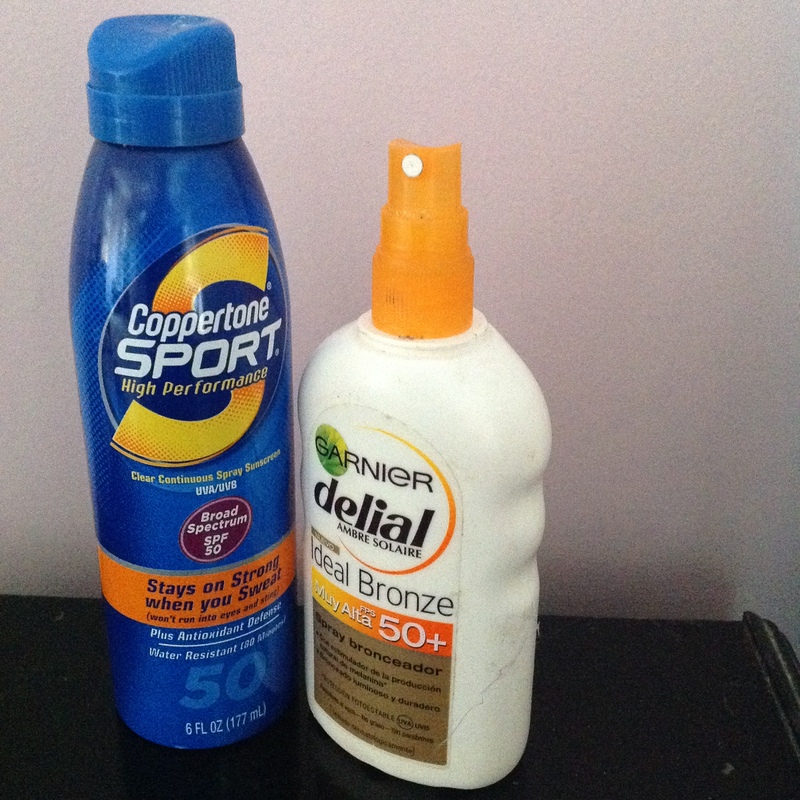 The sunscreen will be thrown away, and the bronzer will be poured down the drain and the bottle will be reused. I just wash my hands when I need too, and I (sometimes remember to) carry a cloth napkin around with me so I can wipe my hands. These got thrown away because they were so old and had been in contact with my face/eyes. I don’t want that bacteria on me! I have really cut down on using makeup at all. Once I decided my skin and hair were beautiful as is, I tried to convince myself my face was ok too. 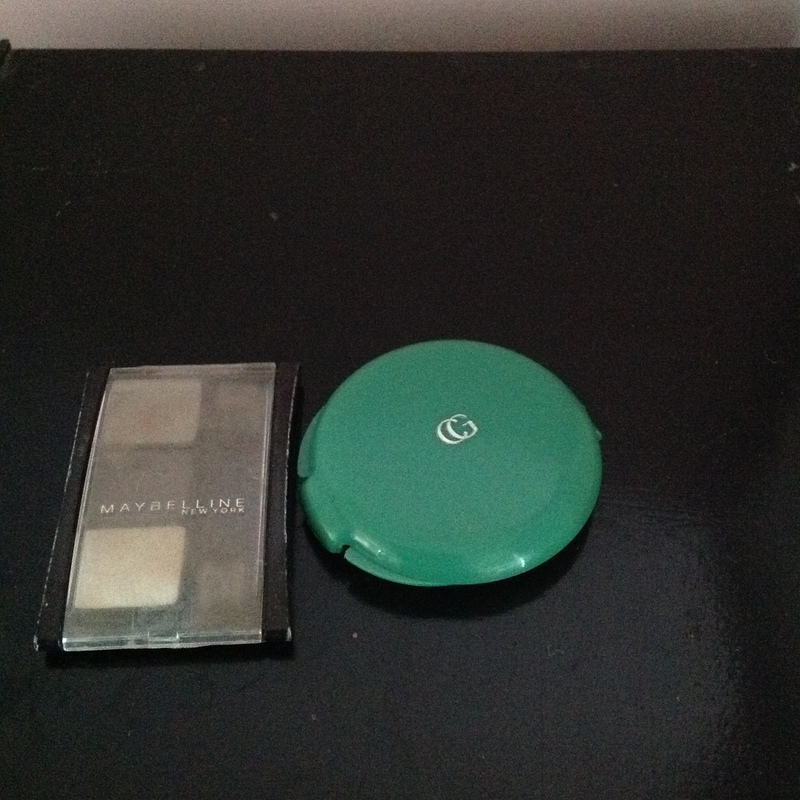 This was a harder challenge for me and I occasionally still use the makeup I have stockpiled from before I went zero waste. (Some days, it’s still a challenge to think my face looks good without makeup, especially if I’m going out at night). Once that makeup is gone I will need to find more sustainable, cruelty free options. ***Start reading here if you decided to skip the list! If that list seemed long, it’s because it was. And I owned all of that stuff!! It’s a lot, and that’s the reason wanted to share it. This post doesn’t have all the answers for zero waste alternatives, because I don’t have all the answers. And that’s ok. The point is that creating a zero waste lifestyle takes time, trial and error, patience, and often self-forgiveness for past choices. It doesn’t happen overnight. As I get more recipes and better solutions to my zero waste dilemmas I will keep you posted, so check back often! And about the hairspray, I think Bea Johnson uses simply water and lemon juice.